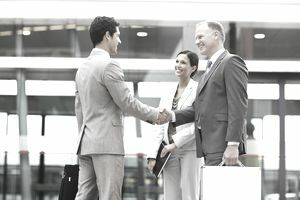 Business etiquette rules for introducing people in a business setting are not much different from the accepted customs of personal introductions in a social setting. Unfortunately, the rules of introduction are not so straightforward and simple as one might think, and who you introduce first does matter. For example, in most social settings in the U.S. (and in fact, worldwide) it is still considered customary and preferred for women to be introduced to men (instead of men being introduced to women). But as women achieve more equality, this rule is changing, particularly in the U.S. business world. Younger people to older people. Junior-ranking professionals to senior-ranking professionals. Business contacts and staff to clients. Personal acquaintances and family members to business professionals when attending a business function. In other words, as a show of respect introduce those of a lower status to those of a higher status whether that means a social or professional status. As antiquated and unfair as this may sound, this protocol for introducing people is still considered socially acceptable (and often expected) in the U.S. and many other countries. It is important to note that under no circumstances should you use introduction rules to socially define people of another race, color, religion, or sexual preference as a someone of a lower status. To do so would be purely inappropriate and discriminatory. The purpose of "designed" introductions is to show respect for the presumed social order based on position or accomplishment, and not to demean or "classify" other people as being inferior. In a business setting, always introduce people by saying their title and full name first, and then follow with a brief, interesting, or relevant piece of information about the people you are introducing. "Dr. Jenkins, this is Sally Rider, our top advertising and marketing executive who will be personally handling your account with us. Sally, this is Dr. Jennifer Wilkins. She heads the women's education department at the Advanced Institute for Business Women. Dr. Wilkins is interested in new ways to market their education programs to women." If the person you are introducing has no title, you do not know her title, or it would seem too formal for a particular setting, you can offer her name first but still follow with information about what she does. When someone has just been introduced to you, your response should be genuine, short, and simple. You should also repeat the person’s name at the end of your greeting. If someone was introduced to you without reference to their title (i.e., Doctor, Mr., Mrs., Ms., etc. ), you have to use some common sense in your reply. Your response should take into account why you are being introduced. Is the introduction a social courtesy or intended to connect you with the purpose of establishing a new relationship? In most cases, introductions as a social courtesy demand a more formal reply (using titles and last names), while introductions to build business relationships between people of equal status can generally be more relaxed. If in doubt, or the introduction is being offered as a courtesy or is very formal always add a title. This shows respect and allows the person being introduced to decide whether or not they want to be on a first-name basis with you.